In my previous 3 posts, I have noted that Missouri’s air quality seems to have improved from 2012 to 2013: the percentage of unhealthy air quality days decreased, and the percentage of good air quality days increased. However, the Air Quality Index is a measure that combines the level of pollution from six criterion pollutants: ozone (O3), sulphur dioxide (SO2), nitrous oxide (NO2), carbon monoxide (CO), particulate matter smaller than 2.5 micrometers (PM2.5), and particulate matter between 2.5 and 10 micrometers (PM10). For a brief discussion of these pollutants, see Update on Missouri Air Quality. The importance of each pollutant varies between counties. For instance, in 2013 the main pollutant in St. Charles County was ozone on all 214 days for which air quality was measured. In Buchanan County, however, PM2.5 was the most important on 353 of 359 days measured, and PM10 was most important on the remaining six. The chart at right shows the percentage of days for which each of the criterion pollutants was the most important one. The chart combines all 20 counties together. Thirty years ago, ozone was a much less important pollutant than it is now. 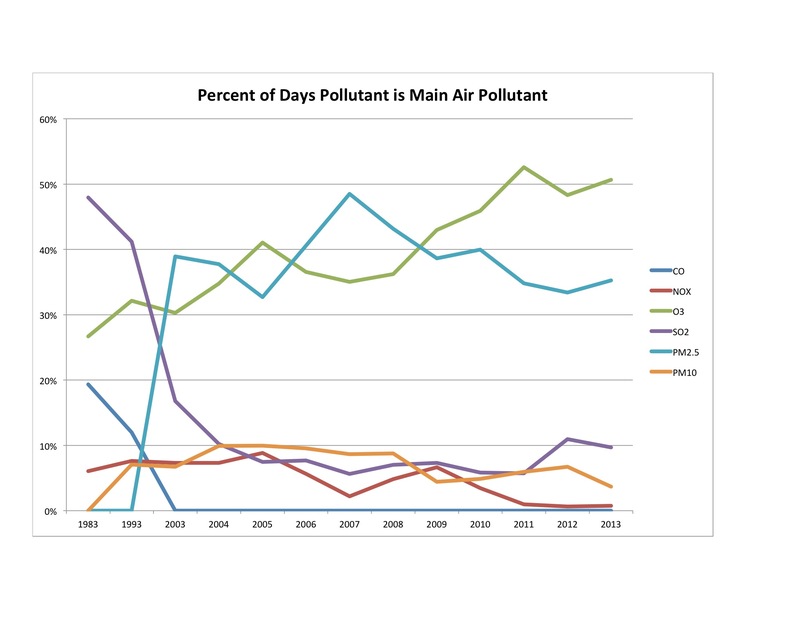 In 1983, it was the most important pollutant on fewer than 30% of the days statewide. It is now the most important pollutant on more than 50% of days, the most important pollutant of all. While we need ozone in the upper atmosphere to shield us from ultraviolet radiation, at ground level it is a strongly corrosive gas that is harmful to plants and animals (including us humans). We don’t emit it directly into the air. Rather, it is created when nitrogen oxides and volatile organic compounds (think vapor from gasoline and other similar liquids) react in the presence of sunlight. These chemicals are emitted into the atmosphere by industrial facilities, electric power plants, and motor vehicles. The second most important pollutant is PM2.5. These tiny particles were not recognized as dangerous until relatively recently, though now they are thought to be the most deadly form of air pollution. I can’t find anything that says so specifically, but I believe their zero readings in 1983 and 1993 means that PM2.5 wasn’t yet being measured in Missouri. The EPA significantly tightened its regulations for PM2.5 a couple of years ago, and the Missouri Department of Natural Resources is in the midst of deploying a program to come into compliance with the new standards. Road vehicles, industrial emissions, power plants, and fires are important sources of PM2.5. Sulphur dioxide used to be by far the most important pollutant, however good progress has been made on reducing SO2 emissions. For the role of SO2 in background air pollution, see this post. Don’t forget that the chart at right does not show the levels of the six pollutants, it only shows the number of days on which each was the most important. As previous posts have clearly shown, air quality is better. I’ll offer some summary conclusions about this air quality data and climb on my soapbox briefly in the next post. Air Quality Index Report, http://www.epa.gov/airdata. By mogreenstats in Air on 2014/11/06 .